Yikes, summer is zipping by! 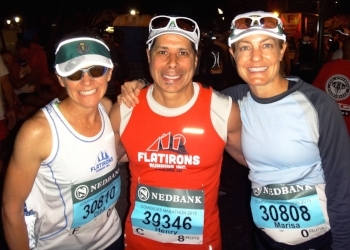 Before I announce what sort of goodies I have lined up next in my athletic endeavors, I wanted to post a few notes about my Comrades race in South Africa on May 31. Quite simply, it is an understatement to say this race is an incredible experience. I won't go into the history of Comrades, but it’s important to know this was the 90th year of this race AND it is the oldest ultra-marathon in the world. That should be enough to warrant some respect. For anyone who wants to read more history, go here. I also did not carry a camera/phone with me during the race, so if you want to see photos, check out Scott Dunlap's blog..
One of my concerns going into this race was the road surface, as this was my first ultra distance on paved surfaces (I so love the dirt!). I had switched to the Brooks PureCadence shoe 2 weeks prior to the race and with plenty of Body Glide on my feet, the wear and tear on my feet was typical rather than nasty gross. This was a big relief for me! Another main concern I had was heat/humidity, even though May is one of the cooler months for South Africa. However, my training was done in the winter months here in Colorado with the bulk of it in sub 45 F weather, so a balmy ~75 F is toasty warm for me. Luckily, the heat was manageable, especially with cold water sachets provided by the aid stations. This race was massive in terms of participation with 16,993 starters. I felt like I finally had some room to move around after mile 25 - it was crowded with where I had started in the corrals. True to its name though, I felt my comrades all around me from start to finish. There was so many friendly runners from all over the world, as each runner’s country was listed on race bibs worn on both the front and back side of the upper body. I’m not a big talker during races, but I admit to starting up a few chats to kill some time and have extra reasons to smile on this special day. I didn’t get to run with my friend, Marisa, as we got separated in the starting corrals. We met up briefly somewhere around mile 17, but then we did not reunite until we found each other in the International tent at the finish line. I was so happy to see her! An extra bonus was having my running friends from Boulder, Suzanne (wife of Henry G) and Cheryl, there who assumed the duties of awesome support & cheering crew! If you follow me or my work with eNRG Performance, you may wonder why I took simple sugars from jelly beans and Coke. To be completely honest, they sounded good to me (the endurance athletes out there know what I mean about the Coke in particular). I don’t know that I really needed them but I also know these calories made up ~10% of my total calories consumed and I had tried these calories during previous competitions with no issue. For total calories, the math works out to ~80-85 calories per hour for this race, which is interesting when you consider there are still a lot of mainstream nutritionists and coaches who push 200-350 calories per hour even for ultra runners. There’s no way I could end my race with a smile on my face having to consume that much! On another note, I am thrilled to have been able to test my own sweat sodium concentration at eNRG Performance and do some sweat rate tests prior to Comrades. This enabled me to fine-tune my electrolyte strategy for a day I knew I would be sweating fairly heavily.